The Impatient Crafter : Retrofabulous Christmas Craftabration: YouTube Video with Bonus Gift Card! Retrofabulous Christmas Craftabration: YouTube Video with Bonus Gift Card! It took three days, lots of juicy expletives, edits, edits and more edits and a crew of two and here we are...the latest The Impatient Crafter video. We're a little rusty around here and we only have one camera and mediocre editing software, but hey, we do what we can with what we've got! Plus, it's free people. Free! Below please find written instructions for the Gift Card. You can get the written instructions for the Retrofabulous Stocking here. Ho, ho, happy holidaze! "These are your grandmother's crafts™" You got a problem with that? 3. Place back of image on sticker sheet, compress and remove. Adhere to inside of gift tag, centering image as you'd like it to fit inside of the window. 4. Layer buttons and crystal. Start with largest button, placing a single glue dot on back and adhering by one of the bottom corners of the window in the tag. Next add the second button with glue dot on the back. 5. Add a dab of Aleene's Tacky glue inside of the second button, use finger tip to gently pick up and place crystal inside. Wipe off any excess glue carefully. 6. Set grommet with Crop-a-dile in upper corner of gift tag. 8. Feel free to stamp the card, add glitter, add more embellishments and make this yours! I loved watching your video! You're adorable and make crafting so fun. I'm very inspired now to start my holiday crafting this weekend! This is the coolest Christmas project video! 1966 was such a fab year (my birth year ;) and your stylin' retro Christmas stocking & gift tag rocks. Fabulous! 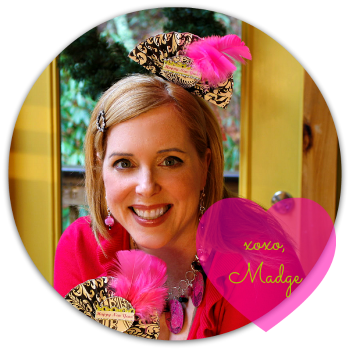 You ARE adorable, Madge -- and you're making handcrafted Christmas marvelous, just marvelous. "These are your grandmother’s crafts" – Not only do I NOT have a problem with that, Margot, I love it! Thanks for the video. I picked up a couple of new techniques, e.g. how you burnish with the scissors handle. How efficient! Loved the retro photos too. TFS.